How Much is One Serving of Fruit or Vegetables? We all know that the food pyramid says we should eat about five servings of fruit and vegetables a day. Turns out, that may not be enough. New research shows that to cut your risk of heart disease, eight servings a day might be needed. Getting eight servings of fruit and vegetables a day is hard for the average college student who is always on the go, but even increasing your fruit and veggie intake by one serving a day can lead you to be healthier. 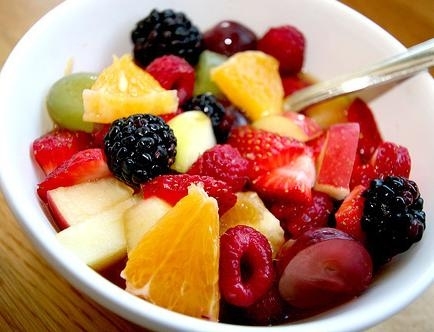 Mix in chopped fruits such as bananas, strawberries, or blueberries with yogurt or cereal for breakfast. Make a fruit smoothie as a healthy snack by blending together your favorite frozen fruits, 100% fruit juice, and nonfat yogurt. Add more colorful vegetables to your salads. The brighter the vegetables the better. Try carrots, bell peppers, spinach, tomatoes, and red and green cabbage. Buy fresh fruits and vegetables from the grocery store. They are easy to eat on the go. Steamed broccoli and cooked cauliflower or green beans are a great side dish with dinner. Drizzle them with a small amount of olive oil, low-fat Italian dressing, or parmesan cheese to enhance the flavor.